Our Cottage has guest rooms on the second floor. All rooms are equipped with air-conditioner/heat and ceiling fans. There is a guest refrigerator/freezer and a hot/cold spring water dispenser for the use of all guests. Rates are based on time of year and day of week. Rates DO NOT include sales and occupancy taxes. The rates listed below apply to reservations made in advance and are subject to change at any time without notice. All rates are posted for double occupancy per night. An additional $30 per person is charged for the suites. This first floor room has a sitting area, a king-size bed, antique dresser, sofa, TV, DVD player, electric fireplace and a private porch. The private, en suite bathroom has a walk-in Italian Carrara marble shower with spa jets. This room also comes with on-site parking. T This unit contains 2 bedrooms, each with a queen-size bed, chairs, TV, DVD player, and electric fireplace. The private, en suite bathroom has a walk-in Italian Carrara marble shower with spa jets. This unit is on the second floor in the front of the house with antique stained-glass windows in both rooms. This room also comes with on-site parking. *This rate is for double occupancy. An additional $30 per person is charged for the suite. 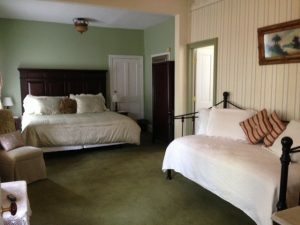 This second floor room has a king-size bed, antique dresser, chair, TV, DVD player and electric fireplace. The private, en suite bathroom has a walk-in Italian Carrara marble shower with spa jets. This room has STREET parking.